Most POS developers says to themselves "Oooo! I want to hide task bar and start button so users can not switch to other exe while using my POS system. I also want to hide this, disable this and kill this, etc." Although in reality most developers do not really say "Oooo!" and instead use stronger words but that is the way I want to paint that expression here for fun, LOL! So they find ways to do that and of course those are always possible via playing with registry settings or in some cases via WinAPIs. However, why go into the trouble of doing all those things when there is simpler and easier way to achieve that? Is it possible to make your exe the only thing running and nothing else? Sure. A normal windows OS uses Explorer.exe as its shell. There are other more 3rd party shells out there in the net and I tried some before but because of familiarity with Explorer, I always go back to the default. What is a shell? So what has an OS shell go to do with what I am trying to say here? When you use Explorer.exe as shell, then it will load the taskbar, it will load the desktop, it will load a lot of everything.... which in the end you wanted to kill or disable later anyway. So why go into the trouble of disabling, hiding, or killing those things later..... when we can simply prevent those to be loaded in the first place? 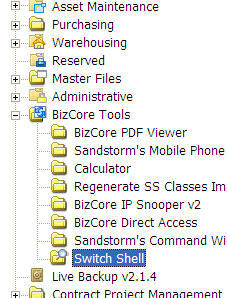 Caption = "Sandstorm's Shell Switcher"
I have not killed Task Manager here so once you have tested your exe to be the Shell and would want to go back to the OS default (Explorer.exe), then you can press Ctrl+Alt+Del keys to active Task Manager, run Explorer.Exe, go to where this code snippet is, run it again and switch back to Explorer as the Shell. Yes, for others who may have not noticed the difference, Vilhelm-Ion is saying use Current User (HKCU) than Local Machine (HKLM). HKCU affects the current user and values there can be altered without being an administrator while HKLM affects all users; and so requires you to be an admin to allow changing values within.